The suspicious Internet Cupom is a browser extension that we identify as a PUP, which stands for “potentially unwanted program.” This browser extension is compatible only with Google Chrome, and it is mainly targeted at computer users who speak Portuguese. According to our research, 95% of all Internet Cupom users live in Brazil. The remaining 5% are divided between users in Portugal and Angola. Surprisingly, the official website associated with this extension, internetcupom.com, is hosted on 142.4.215.121 IP that is located in Beauharnois, Canada. The same server also hosts netcupom.com, a site that appears to offer similar services. Both of these sites supposedly promote reliable shopping coupons that users can access by installing browser extensions. We do not recommend installing either of these programs because they deserve removal. If you keep reading, you will learn how to delete Internet Cupom and why you should consider the removal of this program. Internet Cupom is officially represented at internetcupom.com, but it is possible that this program will be offered by unpredictable third-party installers as well. Have you found this extension packaged along with unfamiliar programs? If you have let these programs in, you have to inspect them, and we recommend using a malware scanner. If malicious programs were downloaded along with Internet Cupom, a scanner will let you know if they require removal, which will help you plan your course of action. Although ignoring malware can be more comfortable at this moment, your virtual security might fall at risk if you remain oblivious about the malware active on your PC. Did you scan your PC and Internet Cupom is the only PUP you need to delete from your operating system? Well, that is good news. Before we start discussing the removal of this suspicious program, we want to introduce you to it so that you would understand the reasons we have for recommending its removal. 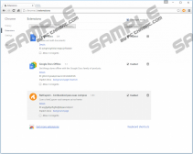 The Chrome extension ID for NetCupom Combustivel para suas compras – the extension associated with Internet Cupom – is aogfgaifppfhgfikdjfplkpeomnllpml. This extension has the permission to “read and change all your data on the websites you visit,” and you give this permission during the installation. It is possible that this permission will be used to record your interaction with the coupons displayed, as well as include new content. The files associated with Internet Cupom are found in a folder under %UserProfile%\Local Settings\Application Data\Google\Chrome\User Data\Default\Extensions. 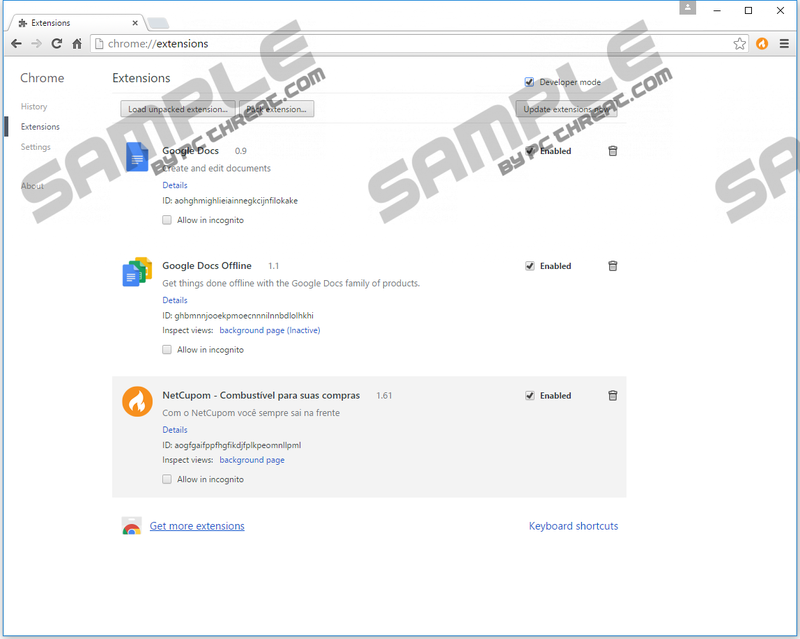 Although you can remove Internet Cupom files found within this folder, we suggest removing the extension directly from the browser. This way, you will not need to worry about the leftovers that might remain in the Local Storage folder under %LocalAppData%\Google\Chrome\User Data\Default. If you are removing these leftovers, look for the “aogfgaifppfhgfikdjfplkpeomnllpml” string in the file names. Internet Cupom spies on you and shows content associated with third parties. These are the main reasons for deleting this suspicious PUP from your operating system. If you are ready to remove Internet Cupom extension, go ahead and follow the instructions below. Fortunately, that is all that you need to do if this PUP is the only suspicious program on your PC. Now, if third-party malware or unwanted programs exist, you will need to perform additional steps. Depending on the software corrupting your PC, it might be wise to employ automated malware detection and removal software that is essential for keeping your operating system protected from malware at all times. Tap Alt+T to open the menu on the right. Click the recycle bin next to the unwanted extension. Under Settings click Content settings. Click All cookies and site data. Select Remove all to eliminate cookies and click Done. Quick & tested solution for Internet Cupom removal.